Not to be confused with Chinese Revolutionary Army. During the Second Sino-Japanese War, the armed forces of the Communist Party of China were nominally incorporated into the National Revolutionary Army (while retaining separate commands), but broke away to form the People's Liberation Army shortly after the end of the war. With the promulgation of the Constitution of the Republic of China in 1947 and the formal end of the KMT party-state, the National Revolutionary Army was renamed the Republic of China Armed Forces, with the bulk of its forces forming the Republic of China Army, which retreated to the island of Taiwan in 1949. The NRA was founded by the KMT in 1925 as the military force destined to unite China in the Northern Expedition. Organized with the help of the Comintern and guided under the doctrine of the Three Principles of the People, the distinction among party, state and army was often blurred. A large number of the Army's officers passed through the Whampoa Military Academy, and the first commandant, Chiang Kai-shek, became commander-in-chief of the Army in 1925 before launching the successful Northern Expedition. Other prominent commanders included Du Yuming and Chen Cheng. The end of the Northern Expedition in 1928 is often taken as the date when China's Warlord era ended, though smaller-scale warlord activity continued for years afterwards. In 1927, after the dissolution of the First United Front between the Nationalists and the Communists, the ruling KMT purged its leftist members and largely eliminated Soviet influence from its ranks. Chiang Kai-shek then turned to Germany, historically a great military power, for the reorganization and modernization of the National Revolutionary Army. The Weimar Republic sent advisors to China, but because of the restrictions imposed by the Treaty of Versailles they could not serve in military capacities. Chiang initially requested famous generals such as Ludendorff and von Mackensen as advisors; the Weimar Republic government turned him down, however, fearing that they were too famous, would invite the ire of the Allies and that it would result in the loss of national prestige for such renowned figures to work, essentially, as mercenaries. When Adolf Hitler became Germany's chancellor in 1933 and disavowed the Treaty, the anti-communist Nazi Party and the anti-communist KMT were soon engaged in close cooperation. with Germany training Chinese troops and expanding Chinese infrastructure, while China opened its markets and natural resources to Germany. Max Bauer was the first advisor to China. In 1934 Gen. Hans von Seeckt, acting as advisor to Chiang, proposed an "80 Division Plan" for reforming the entire Chinese army into 80 divisions of highly trained, well-equipped troops organised along German lines. The plan was never fully realised, as the eternally bickering warlords could not agree upon which divisions were to be merged and disbanded. Furthermore, since embezzlement and fraud were commonplace, especially in understrength divisions (the state of most of the divisions), reforming the military structure would threaten divisional commanders' "take". Therefore, by July 1937 only eight infantry divisions had completed reorganization and training. These were the 3rd, 6th, 9th, 14th, 36th, 87th, 88th, and the Training Division. 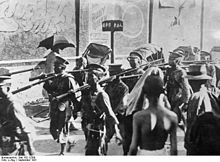 For a time, during the Second Sino-Japanese War, Communist forces fought as a nominal part of the National Revolutionary Army, forming the Eighth Route Army and the New Fourth Army units, but this co-operation later fell apart. Throughout the Chinese Civil War the National Revolutionary Army experienced major problems with desertion, with many soldiers switching sides to fight for the Communists. 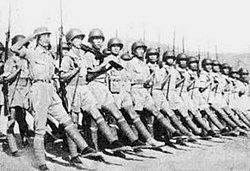 Troops in India and Burma during World War II included the Chinese Expeditionary Force (Burma), the Chinese Army in India and Y Force. After the drafting and implementation of the Constitution of the Republic of China in 1947, the National Revolutionary Army was transformed into the ground service branch of the Republic of China Armed Forces – the Republic of China Army (ROCA). The NRA throughout its lifespan recruited approximately 4,300,000 regulars, in 370 Standard Divisions (正式師), 46 New Divisions (新編師), 12 Cavalry Divisions (騎兵師), eight New Cavalry Divisions (新編騎兵師), 66 Temporary Divisions (暫編師), and 13 Reserve Divisions (預備師), for a grand total of 515 divisions. However, many divisions were formed from two or more other divisions, and were not active at the same time. Also, New Divisions were created to replace Standard Divisions lost early in the war and were issued the old division's number. Therefore, the number of divisions in active service at any given time is much smaller than this. The average NRA division had 5,000–6,000 troops; an average army division had 10,000–15,000 troops, the equivalent of a Japanese division. Not even the German-trained divisions were on par in terms of manpower with a German or Japanese division, having only 10,000 men. The NRA only had small number of armoured vehicles and mechanised troops. At the beginning of the war in 1937 the armour were organized in three Armoured Battalions, equipped with tanks and armoured cars from various countries. After these battalions were mostly destroyed in the Battle of Shanghai and Battle of Nanjing. The newly provided tanks, armoured cars, and trucks from the Soviet Union and Italy made it possible to create the only mechanized division in the army, the 200th Division. This Division eventually ceased to be a mechanized unit after the June 1938 reorganization of Divisions. The armoured and artillery Regiments were placed under direct command of 5th Corps and the 200th Division became a motorized Infantry Division within the same Corps. This Corps fought battles in Guangxi in 1939–1940 and in the Battle of Yunnan-Burma Road in 1942 reducing the armored units due to losses and mechanical breakdown of the vehicles. 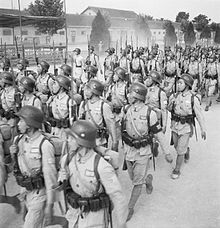 On paper China had 3.8 million men under arms in 1941. They were organized into 246 "front-line" divisions, with another 70 divisions assigned to rear areas. Perhaps as many as forty Chinese divisions had been equipped with European-manufactured weapons and trained by foreign, particularly German and Soviet, advisers. The rest of the units were under strength and generally untrained. Overall, the Nationalist Army impressed most Western military observers as more reminiscent of a 19th- than a 20th-century army. Late in the Burma Campaign the NRA Army there had an armored battalion equipped with Sherman tanks. Despite the poor reviews given by European observers to the European-trained Divisions, the Muslim Divisions of the National Revolutionary Army, trained in China (not by westerners) and led by Ma Clique Muslim generals, frightened the European observers with their appearance and fighting skills in battle. Europeans like Sven Hedin and Georg Vasel were in awe of the appearance Chinese Muslim NRA divisions made and their ferocious combat abilities. They were trained in harsh, brutal conditions. The 36th Division (National Revolutionary Army), trained entirely in China without any European help, was composed of Chinese Muslims and fought and severely mauled an invading Soviet Russian army during the Soviet Invasion of Xinjiang. The division was lacking in technology and manpower, but badly damaged the superior Russian force. The Muslim divisions of the army controlled by Muslim Gen. Ma Hongkui were reported by western observers to be tough and disciplined despite having diabetes. Ma Hongkui personally drilled with his troops, and engaged in sword fencing during training. When the leaders of many of the warlord and provincial armies joined with the KMT and were appointed as officers and generals, their troops joined the NRA. These armies were renamed as NRA divisions. The entire Ma Clique armies were absorbed into the NRA. When the Muslim Ma Clique General Ma Qi joined the KMT, the Ninghai Army was renamed the National Revolutionary Army 26th Division. 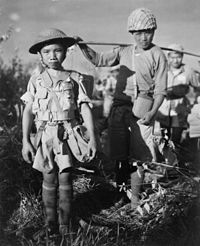 A Chinese Nationalist soldier, age 10, member of a Chinese division from the X Force, boarding planes in Burma bound for China, May 1944. The unit organisation of the NRA is as follows: (Note that a unit is not necessarily subordinate to one immediately above it; several army regiments can be found under an army group, for example.) The commander-in-chief of the NRA from 1925 to 1947 was Generalissimo Chiang Kai-shek. Army Corps ×4(兵團) – the Army Corps, 兵團, was one of the largest military formations in the NRA during the Second Sino-Japanese War. These Army Corps were composed of a number of Group Armies, Army, Corps, Divisions, Brigades and Regiments. In numbers of divisions, they were larger than Western Army groups. Only four were ever formed to command the large forces defending the Chinese capital during the Battle of Wuhan in 1938. (See Order of battle of Battle of Wuhan). Corps ×133 (軍團 Army Group) – usually exercised command over two to three NRA Divisions and often a number of Independent Brigades or Regiments and supporting units. The Chinese Republic had 133 Corps during the Second Sino-Japanese War. After losses in the early part of the war, under the 1938 reforms, the remaining scarce artillery and the other support formations were withdrawn from the Division and was held at Corps, or Army level or higher. The Corps became the basic tactical unit of the NRA having strength nearly equivalent to an allied Division. During the Xinhai Revolution and the Warlord Era of the Republic of China (1912–1949), "Dare to Die Corps" (traditional Chinese: 敢死隊; simplified Chinese: 敢死队; pinyin: gǎnsǐduì) or "Suicide squads" were frequently used by Chinese armies. China deployed these suicide units against the Japanese during the Second Sino-Japanese War. "Dare to Die" troops were used by warlords in their armies to conduct suicide attacks. "Dare to Die" corps continued to be used in the Chinese military. The Kuomintang used one to put down an insurrection in Canton. Many women joined them in addition to men to achieve martyrdom against China's opponents. A "dare to die corps" was effectively used against Japanese units at the Battle of Taierzhuang. They used swords. Suicide bombing was also used against the Japanese. A Chinese soldier detonated a grenade vest and killed 20 Japanese soldiers at Sihang Warehouse. Chinese troops strapped explosives like grenade packs or dynamite to their bodies and threw themselves under Japanese tanks to blow them up. 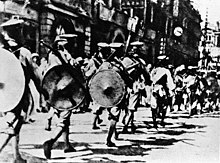 This tactic was used during the Battle of Shanghai, where a Chinese suicide bomber stopped a Japanese tank column by exploding himself beneath the lead tank, and at the Battle of Taierzhuang where dynamite and grenades were strapped on by Chinese troops who rushed at Japanese tanks and blew themselves up. In one incident at Taierzhuang, Chinese suicide bombers obliterated four Japanese tanks with grenade bundles. 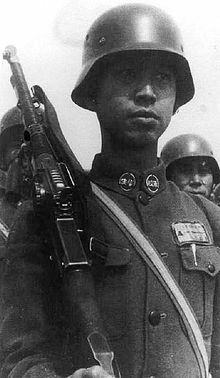 During the Chinese Civil War the National Revolutionary Army (NRA) was known to have used penal battalions from 1945 to 1949. A unit made up of deserters and those accused of cowardice, the penal battalion was giving such tasks as scouting ahead of the main forces to check for ambushes, crossing rivers and torrents to see whether they were fordable, and walking across unmapped minefields. This was a deadly affair in which men were kidnapped for the army, rounded up indiscriminately by press-gangs or army units among those on the roads or in the towns and villages, or otherwise gathered together. Many men, some the very young and old, were killed resisting or trying to escape. Once collected, they would be roped or chained together and marched, with little food or water, long distances to camp. They often died or were killed along the way, sometimes less than 50 percent reaching camp alive. Then recruit camp was no better, with hospitals resembling Nazi concentration camps like Buchenwald. Chinese weapons were mainly produced for the National Revolutionary Army in the Hanyang, Guangdong and Taiyuan Arsenals. German-equipped Chinese troops practicing a march at the Chinese Military Academy at Chengtu in 1944. For regular provincial Chinese divisions the standard rifles were the Hanyang 88 (copy of Gewehr 88). Central army divisions were typically equipped with the Chiang Kai-shek rifle (copy of Mauser Standard Model) and Czechoslovakian vz. 24. However, for most of the German-trained divisions, the standard firearms were German-made 7.92 mm Gewehr 98 and Karabiner 98k. The standard light machine gun was a local copy of the Czech 7.92 mm Brno ZB26. There were also Belgian and French light machine guns. Provincial units generally did not possess any machine guns, while Central Army units had one LMG per platoon on average. The German-trained divisions ideally had 1 LMG per squad. Surprisingly, the NRA did not purchase any Maschinengewehr 34s from Germany, but did produce its own copies of them. Heavy machine guns were mainly locally-made Type 24 water-cooled Maxim guns (which were the Chinese copies of the German MG08), and Type 30 M1917 Browning machine guns chambered for the standard 8mm Mauser round. On average, every Central Army battalion would get one heavy machine gun (about a third to half of what actual German divisions got during World War II). The standard sidearm for NCOs and officers was the 7.63 mm Mauser C96 semi-automatic pistol, or full-automatic Mauser M1932/M712 machine pistol. These full-automatic versions were used as substitutes for submachine guns (such as the MP 18) and rifles that were in short supply within the Chinese army prior to the end of World War II. 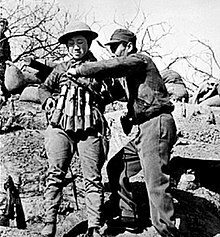 Throughout the Second Sino-Japanese War, particularly in the early years, the NRA also extensively used captured Japanese weapons and equipment. as their own were in short supply. Some élite units also used Lend-Lease US equipment as the war progressed. US-equipped Chinese Army in India marching. Generally speaking, the regular provincial army divisions did not possess any artillery. However, some Central Army divisions were equipped with 37 mm PaK 35/36 anti-tank guns, and/or mortars from Oerlikon, Madsen, and Solothurn. Each of these infantry divisions ideally had 6 French Brandt 81 mm mortars and 6 Solothurn 20 mm autocannons. Some independent brigades and artillery regiments were equipped with Bofors 72 mm L/14, or Krupp 72 mm L/29 mountain guns and there were 24 Rheinmetall 150 mm L/32 sFH 18 howitzers (bought in 1934) and 24 Krupp 150 mm L/30 sFH 18 howitzers (bought in 1936). At the start of the war, the NRA and the Tax Police Regiment had three tank battalions armed with German Panzer I light tanks and CV-33 tankettes. After defeat in the Battle of Shanghai the remaining tanks, together with several hundred T-26 and BT-5 tanks acquired from the Soviet Union were reorganised into the 200th Division. Infantry uniforms were basically redesigned Zhongshan suits. Puttees were standard for soldiers and officers alike, since the primary mode of movement for NRA troops was by foot. Troops were also issued sewn field caps. The helmets were the most distinguishing characteristic of these divisions. From the moment German M35 helmets (standard issue for the Wehrmacht until late in the European theatre) rolled off the production lines in 1935, and until 1936, the NRA imported 315,000 of these helmets, each with the Blue Sky with a White Sun emblem of the ROC on the sides. These helmets were worn by both elite German-trained divisions and regular Central Army divisions. Other helmets included the French Adrian helmet, the British Brodie helmet and later the American M1 helmet. Other equipment included straw shoes for soldiers (cloth shoes for Central Army), leather shoes for officers and leather boots for high-ranking officers. Every soldier was issued ammunition for his weapon, along with ammunition pouches or harness, a water flask, combat knives, food bag, and a gas mask. Spears and swords in addition to rifles were used by the Muslim Ma Clique sections of the National Revolutionary Army, who were renowned for their fine cavalry. The Muslims had an assortment of rifles, German, British, Russian and others. ^ "National Revolutionary Army Summary – China's Military in WWII". Totally History. 2013-06-07. Retrieved 2018-05-20. ^ Joes, Anthony (2010-11-19). Victorious Insurgencies: Four Rebellions that Shaped Our World. University Press of Kentucky. ISBN 9780813129723. ^ Andrew D. W. Forbes (1986). Warlords and Muslims in Chinese Central Asia: a political history of Republican Sinkiang 1911–1949. Cambridge, England: CUP Archive. p. 97. ISBN 0-521-25514-7. Retrieved 2010-06-28. ^ Andrew D. W. Forbes (1986). Warlords and Muslims in Chinese Central Asia: a political history of Republican Sinkiang 1911–1949. Cambridge, England: CUP Archive. p. 120. ISBN 0-521-25514-7. Retrieved 2010-06-28. ^ Christian Tyler (2004). Wild West China: the taming of Xinjiang. New Brunswick, New Jersey: Rutgers University Press. p. 109. ISBN 0-8135-3533-6. Retrieved 2010-06-28. ^ Andrew D. W. Forbes (1986). Warlords and Muslims in Chinese Central Asia: a political history of Republican Sinkiang 1911–1949. Cambridge, England: CUP Archive. p. 107. ISBN 0-521-25514-7. Retrieved 2010-06-28. ^ a b Inc, Time (1 November 1948). "LIFE". Time Inc. Retrieved 20 March 2018 – via Google Books. ^ a b Hsu Long-hsuen and Chang Ming-kai, History of The Sino-Japanese War (1937–1945) 2nd Ed., 1971. Translated by Wen Ha-hsiung, Chung Wu Publishing; 33, 140th Lane, Tung-hwa Street, Taipei, Taiwan Republic of China. ^ LEAR. "词语"敢死队"的解释汉典zdic.net". Retrieved November 7, 2014. ^ "敢死队的意思,含义,拼音,读音-敢死队的汉语词典解释". Retrieved November 7, 2014. ^ "6. 敢死队 gǎnsǐduì". zgxc.org.cn. Retrieved 20 March 2018. ^ 敢死队_百科词条, so.baike.com; accessed July 15, 2015. ^ 海词词典. "dare-to-die ship". Retrieved November 7, 2014. ^ "a dare-to-die corps 的翻译是:敢死队是什么意思?英文翻译中文,中文". Retrieved November 7, 2014. ^ "敢死队,a dare-to-die corps,音标,读音,翻译,英文例句,英语词典". www.dictall.com. Retrieved 20 March 2018. ^ "a dare-to-die corps – 中英文在线翻译英语在线翻译". Archived from the original on October 30, 2014. Retrieved November 7, 2014. ^ "敢死队 – 汉语词典 – 911查询". Retrieved November 7, 2014. ^ "敢_百度百科". Retrieved November 7, 2014. ^ Jowett, Philip S. (1997). Chinese Civil War Armies 1911–49. 306 (illustrated ed.). Osprey Publishing. p. 14. ISBN 1855326655. Retrieved April 24, 2014. ^ Marjorie Wall Bingham, Susan Hill Gross (1980). Women in modern China: transition, revolution, and contemporary times. Glenhurst Publications. p. 34. ISBN 0-86596-028-3. Retrieved July 28, 2010. ^ Fenby, Jonathan (2003). Generalissimo: Chiang Kai-shek and the China He Lost. Simon and Schuster. p. 319. ISBN 0743231449. Retrieved April 24, 2014. ^ Fenby, Jonathan (2009). Chiang Kai Shek: China's Generalissimo and the Nation He Lost. DaCapo Press. p. 319. ISBN 0786739843. Retrieved April 24, 2014. ^ Fenby, Jonathan (2008). Modern China: the fall and rise of a great power, 1850 to the present. Ecco. p. 284. ISBN 0061661163. Retrieved April 24, 2014. ^ Li, Leslie (1992). Bittersweet. C.E. Tuttle. p. 234. ISBN 0804817774. Retrieved April 24, 2014. ^ Gao, James Z. (2009). Historical Dictionary of Modern China (1800-1949). Volume 25 of Historical Dictionaries of Ancient Civilizations and Historical Eras (illustrated ed.). Scarecrow Press. p. 350. ISBN 0810863081. Retrieved 24 April 2014. ^ Fenby, Jonathan (2010). The General: Charles DeGaulle and the France He Saved. Simon and Schuster. p. 319. ISBN 0857200674. Retrieved April 24, 2014. ^ Jonathan Fenby (27 April 2009). Chiang Kai Shek: China's Generalissimo and the Nation He Lost. Da Capo Press. ISBN 0-7867-3984-3. ^ 网易. "台儿庄巷战:长官电令有敢退过河者 杀无赦_网易军事". war.163.com. Retrieved 20 March 2018. ^ "官网". www.88p4.com. Retrieved 20 March 2018. ^ Harmsen, Peter (2013). Shanghai 1937: Stalingrad on the Yangtze (illustrated ed.). Casemate. p. 112. ISBN 161200167X. Retrieved April 24, 2014. ^ Ong, Siew Chey (2005). China Condensed: 5000 Years of History & Culture (illustrated ed.). Marshall Cavendish. p. 94. ISBN 9812610677. Retrieved 24 April 2014. ^ Olsen, Lance (2012). Taierzhuang 1938 – Stalingrad 1942. Numistamp. Clear Mind Publishing. ISBN 978-0-9838435-9-7. Retrieved April 24, 2014. ^ Ong, Siew Chey (2011). China Condensed: 5,000 Years of History & Culture (reprint ed.). Marshall Cavendish International Asia Pte Ltd. p. 79. ISBN 9814312991. Retrieved April 24, 2014. ^ Lynch, Michael (2010). Osprey Guide to...The Chinese Civil War 1945–1949. Osprey Publishing. pp. Kindle Locations 878-880. ISBN 978 1 4728 1025 0.